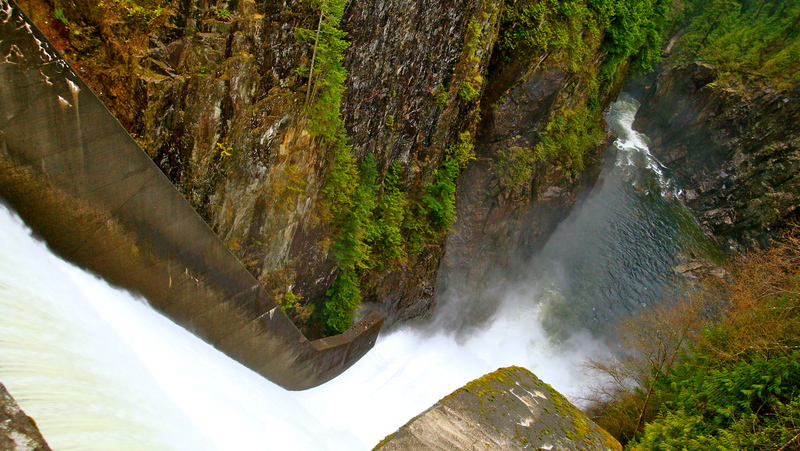 Photo: Cleveland Dam, North Vancouver. Hi John, what a lovely reflection on time 🙂 Have a very good 2014! Hi John (Happy New Year)……this is a bit weird. A short TIME ago I posted my new post……..The Race To Save TIME. Then going through my emails I see this new post of yours……..TIME! I guess it could be just another coincidence but ……..
Love the image (giant slipperyslide) and of course …..your poem. Time is a tsunami. Excellent image. Earlier today I was wondering if time was real and took a look at my hands and face and concluded that even it isn’t its passage is. And of course a tsunami doesn’t stop at the shore. Here it comes. And all that space in your photo to fill! Great reflection on this 2013 passage. Thank you John. Happy New Year! Happy New Year John. Love the photo and the poem… it must have been a rush feeling the power of the water while snapping photos of the spectacular scene below. Happy New Year, John! This was an apt depiction of time, and beautifully written. Makes me want to work faster….got to get things finished! All the best for 2014.